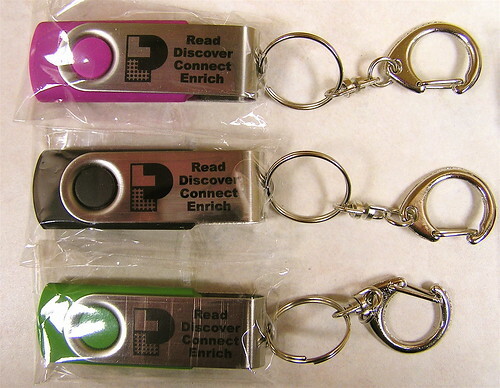 LPL Flashdrives, originally uploaded by Lester Public Library. 512K? Where on earth did Lester Public Library manage to find 512K flash drives in 2008? I’m guessing 512M–still pretty small for a 2008 thumb drive, but three orders of magnitude better. Hey walt, my mistake – it is a 512 MB. Well, 512MB is not too bad – for carrying a few files! But, hey, it’s flashy (no pun intended) and sports the library’s logo. Now I wonder if patrons are allowed to use them on the computers in the library? You bet the patrons can use them on our computers! Logo AND mission statement, that’s right, that is Lester Public Library’s Mission Statement, Read, Discover, Connect, Enrich.